Every time I reopend the Find and Replace dialog box (CTRL+H) in Microsoft Visual Studio 2010, the width of the dialog box grew by several pixels. I was looking through various settings in Visual Studio, however, I haven’t thought of a bug in Visual Studio at all. In case you use the Find and Replace dialog quite often, you might download and install the hotfix from the connect site. This entry was posted in troubleshooting and tagged troubleshooting, visual studio on September 29, 2010 by andreas. Today, we encountered a really interesting issue with Visual Studio 2010, ASP.NET and Master Pages. 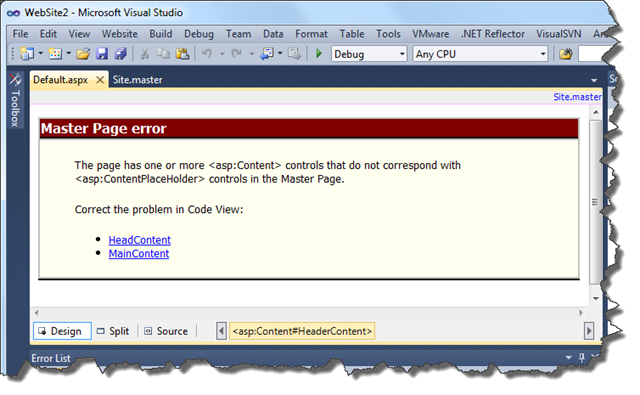 Actually Visual Studio denied the design view for all of the pages within the solution except to the master page. The page has one or more <asp:Content> controls that do not correspond with <asp:ContentPlaceHolder> controls in the Master Page. No doubt you would check all the pages as well. After verifying that all pages have been correct, the ID as well as the ConteptPlaceHolderID tags are set correctly, you might see that the issue is till persistent. In this case check your HTML source code of the Master Page. In particular check for all HTML tags with self closing syntax. Referring the W3C Recommendation for XHTML section C.3 there are some tags that should be not used with self closing syntax. Eventually, you now will review again your source code for any XHTML tags in their minimized form. and the issue will be fixed. Even better would be of course to give your page a title. While most browsers are quite forgiving here, the Visual Studio designer quits his job. Unfortunately, the error displayed is misleading and you might waste some time in reviewing Master Pages and ASP.NET controls that are obviously correct. Whether this is a bug or Visual Studio designer doing the right job and failing just for those tags based on the W3C Recommendation – it does of course not help a lot if Visual Studio does provide a misleading error message to the developer. This entry was posted in troubleshooting and tagged .net, troubleshooting, visual studio, web on September 23, 2010 by andreas. Over the last couple of years, I run my blog using the dasBlog engine. As I started hosting the blog in 2004 on my own server, I choose dasBlog as it did not need any database on the backend, saved everything in XML and did a great job on the full text search over the XML content. Beside that, a blog engine running on ASP.NET seemed the right choice being familiar with the technology. Eventually, I did several fixes and hacks on my installation over the last few years. Unfortunately, there was no new release since March 2009. As I like playing with alternative technologies from time to time and WordPress comes with a rich set of features I miss at dasBlog, I decided to migrate to WordPress. In this article I will describe the steps moving forward to WordPress hosted on a Windows Server 2008. Moving forward to the new platform includes several steps. First of all the server has to be prepared to host the new platform. After the new blog engine is set up, the content needs to be migrated. Finally, the old engine needs to be shut down and the server needs to be set up to forward requests to the old engine to the new one. Installing WordPress should be relatively easy as it is available through the Microsoft Web Platform Installer 2.0. However, you might encounter issues during the process on machines running IIS 7 as the required Windows Update KB980363 causes the installation process to hang. The update process only hangs when started from within the Web Platform Installer, so pick it from the Microsoft Download Page and install the hotfix beforehand. Before installing WordPress you need to install PHP on the server. In addition to the instructions how to configure PHP on IIS 7, Ruslan Yakushev provides a very good tutorial how to set up FastCGI on Windows Server 2008. Originally, I planned to use BlogML to migrate the content from dasBlog to Worpress. 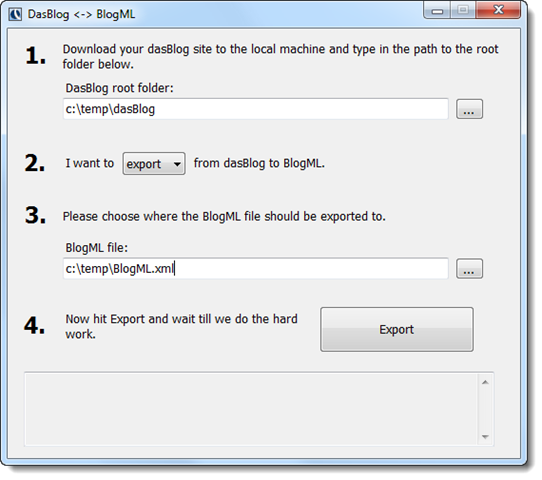 Instead I found dasBLogML which is a simple GUI wrapper around the original BLogML. First you download the content of the old blog to your local machine. To import the BlogML data, you might want to follow Edgardo Vega’s article. In order to avoid potential problems during the import, also have a look at Daniel Kirstenpfad’s tip about replacing all &nbsp; occurrences in the XML file. Using the BLogML Importer plug-in you can finally import the previously exported XML file. In the final step I had to redirect the requests from the old blog to the new one. There are several issues to think about: First of all, all binaries are still referred from the old blog. Consequently it is not possible to just shut it down. Furthermore, there are many entries that are linked from several places all over the web. “The requested resource has been assigned a new permanent URI and any future references to this resource SHOULD use one of the returned URIs. Clients with link editing capabilities ought to automatically re-link references to the Request-URI to one or more of the new references returned by the server, where possible. This response is cacheable unless indicated otherwise. To create the redirect locations I use a set of Regex objects that cover the most important URI types. Now everything beside the content can be deleted from the old dasBlog installation. In order to avoid any requests not covered by the previously deployed module, the custom error page for status code 404 is set to the corresponding URI on the news blog. After deploying the module (into the bin folder of the dasBlog installation) it needs to be added to the web.config. Therefore you just have to add it to the httpModules section. 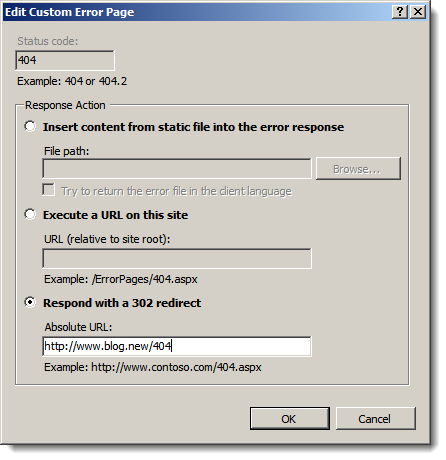 If the application pool is running in Classic mode, the custom error pages do not cover any ASP.NET content. Therefore add the customError section into to web.config file. Now all requests that do not request any content from the old blog or which a are not redirected by your module are covered by the new WordPress blog. Now the content from the old dasBlog instance are displayed on the new WordPress blog, the most important links to your old dasBlog pages are covered by the URI redirection to the new blog and all the rest is caught by the WordPress blog as well. You might want to extend the redirect module with further regular expressions (e.g. to cover CommentView.aspx or other dasBlog pages). This entry was posted in web and tagged how-to, web, wordpress on September 18, 2010 by andreas. If you are using your Windows machine for a while, it is inevitable that you install a whole bunch of Software. Especially a developer machine might end up with a lot of application and tools, you use for work or evaluation. This is the first article in a series of steps how to clean up your Windows machine, and to optimize your personal workflow. Some tool that come with support for a particular file extension might extend the Windows Explorer ‘New’ sub menu. In my case I currently ended up with about 20 entries, while I regularly use only two or three of them. Most if them I barely touch. To minimize noise and to speed up your personal workflow you might want to get rid of some of them and renaming others. E.g. all Office documents are usually prefixed with ‘Microsoft’ while you might just want to see them as ‘Word Document’ or ‘Excel Document’. However, maintaining this list is rather time-consuming task and no fun at all. After some investigation I found a very nice freeware tool called ShellMenuNew from NirSoft that eventually does the job for you. It’ is a small tool which does not need to be installed and can be used straight away. By right-clicking any of the entries you can select ‘Disable Selected Menu Items’. Once you open up the ‘New’ submenu in Windows Explorer the menu should be look much tidier. In case you change your mind, you can always start ShellMenuNew again and enable the file extensions again. The tool worked nicely on my x64 Windows 7. Regarding the author’s website it should also work on Windows 2000, Windows XP, Windows Server 2003/2008, and Windows Vista. Solved this task, the renaming of the entries is still pending. Also here a small freeware tool comes in handy. Default Programs Editor provides a set of functionality to edit file type settings, autoplay settings and default programs settings. Also this tool can be sued straight away and does not need any installation. Default Programs Editor lets you easily change any kinds of associations with respect to files extension. Using the ‘File Type Settings’ you can select the ‘Description’, search for the file type you want to rename and finally change the file type description. Using those two tools it is possible to minimize noise in your working environment without hacking the registry manually. This entry was posted in tools and tagged tools, windows on September 12, 2010 by andreas.